green tea: So, I wrecked my MacBook. So, I wrecked my MacBook. Two weeks ago, I had a clumsy moment which is going to cost me quite a lot of money. It has already caused me plenty of inconvenience. I was working with my MacBook on my lap with an almost empty mug of tea on the bed beside me. I moved to reach something, closing the laptop and placing it on the bed surface. My leg bumped the hitherto untippable mug which caused about 1/2 a cup of water to spill and some leaked in the back vents of the laptop. There was a crackling sound and the laptop immediately switched itself off. I wasn't panicked by this, I thought that the immediate switch-off would prevent any shocks from causing harm to the machine. Besides, there was very little water spilled. I wiped down the laptop and left it to dry. The next day, I went to the Apple Store 'Genius Bar' to check on how to proceed to avoid damaging my MacBook. I was advised to leave it to dry for four to five days and then to bring it back to the store to check for moisture inside. So, I left the Macbook untouched for five more days. Back at the Apple Store, a different 'Genius' removed the back of the laptop and we could clearly see green corrosion on the logic board. This wasn't good. We tried to boot the laptop. The fan and the power light switched on but the screen did not react. We plugged in an external monitor and there was still no image visible. So, for sure the logic board is damaged to some extent and maybe the screen and some of the connectors. The question is, how much damage can a trickle of cold tea do to a closed but running MacBook Pro? 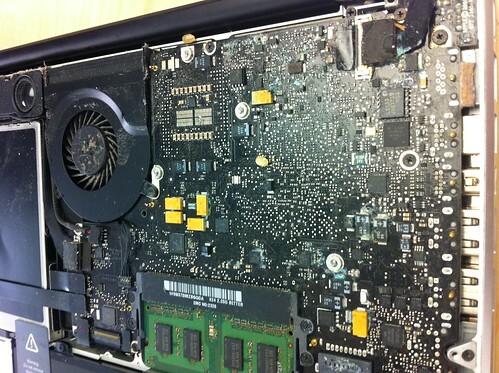 Bad Case Scenario: $500 to replace the corroded logic board but screen and connectors and hard drive are all fine. Data is safe. Worse Case Scenario: logic board and screen both need replacing, the expense of which will cost more than a refurbished, newer MacBook Pro. Hard drive can be salvaged and used as an external drive, data is safe. Worst Case Scenario: logic board and screen both need replacing, the expense of which will cost more than a refurbished, newer MacBook Pro. Hard drive wrecked and all data lost. Now, luckily, my better photos from the past year are already on Flickr and many others are still on a memory card. Also, my Thimphu map files are backed up. I don't have any super-important word files on the go. My iPod Nano still holds all my music but this would have to be extracted somehow to load onto a new laptop. It's the casual photos I took walking around or with friends that I may have lost, as well as several videos I never got around to uploading or which were just for my own viewing. I still don't know what state my data is in at the moment. Over the past two weeks, I have confirmed that I can't get by for long without a good computer. I have been doing my freelance technical editing work on my early 2006 iMac and it's been rough (losing my 'saved' work, lots of freezing). Over the past year, my iMac has been solely a DVD viewing apparatus. My last two blog posts were about the most complex task that machine can handle. I can't even run Skype. I can't stop beating myself up for causing such an expense and possible loss of files due to my own clumsiness and overly casual consumption of tea. It's a waste of time to dwell on it, but I can't help it. I had been intending to get smarter about saving money but now I'm facing a large expense. I am, however, grateful that I didn't cause this kind of damage when I was really depending on the MacBook for my work in Thimphu. It would have been a true disaster for my project had I lost the use of my laptop then. At that time, the closest Apple Store would have been in Delhi, 1200 km away. There are more white yaks than MacBook Pros in Bhutan. I could have been in serious trouble. I am soooo sorry. There are definitely applications out there to extract your music from your nano onto a new laptop. Not sure what they're called though. If you need a hand getting files I can help you out. All you would need would be the actual physical hard drive out of the Macbook Pro and I can help you. Oh I feel the pain. It gets easier, but you never forget. About a year ago I had some friends over for drinks. My good friend and I were watching a video on youtube when she decided to do a ballerina like spin on my office desk chair. I missed that she had placed her red wine beside my macbook pro. At the end of her pirouette she knocked the glass (full) right onto my keyboard. It was a quick death. Would cost more to fix then replace.